The last thing you need is one more business system or solution to keep up with. Thankfully Webinato can integrate with your existing systems so you can manage your account more efficiently by automatically creating, managing and reporting on events. We want to create a seamless experience for everyone involved. And we do that by having a rich suite of function based APIs allowing you to send or receive a wide range of data to and from our system. Set it and forget it – Everything happens as you want it to without constantly needing to repeat actions. Note: Having a skilled web programmer who has a strong knowledge of programming languages (such as PHP) means you can implement these APIs within hours. 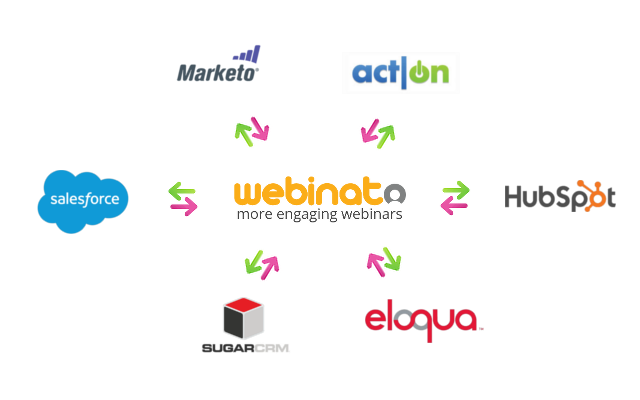 Also note the Webinato OPTiMA team can help you with these integration efforts. There are primarily two different ways to integrate with Webinato: either you use our direct APIs (listed below) or you integrate through Zapier’s plug-n-play platform that lets you communicate to 750+ different systems including all CRMs or LMSes you can think of! Click HERE to learn more about Zapier and on how you can simply integrate Webinato with 400+ other platforms. Our most popular API connects your website membership database with the Webinato login page. Once an attendee is registered on your website, we can prefill and verify membership or user status to allow them to register for the appropriate webinar. Attendees no longer need to remember multiple passwords or register at multiple places, thus simplifying the user experience. Visit our SSO example site to see it in action and learn more by visiting our knowledgebase. Create custom-made room usage reports that can integrate with your own database, CRM or reporting system. All of the other APIs push data to our system, this one pulls the data. Once an event is over, you can pull that data and import it to your own system. Easily integrate with the Marketo automation service using this method. This is not actually a real API but more instructions on how to set up your Marketo and your Webinato account to connect them together. Acts as a one-click registration. If you have a registration system, you can pre-fill contact info from your database so users won’t have to refill their info each time they want to register for your AutoPilot on-demand or live session. For those utilizing Webinato across their enterprise and recording events daily, this API, when used in conjunction with the Archive API, will allow you to schedule the conversion of your AutoPilot recordings into mp4s for a more permanent storage solution. Retrieve details about your recorded sessions, or AutoPilot: who has viewed, how long they viewed, etc. Create an extra revenue stream by accepting payment for viewing previously recorded sessions. This API will allow you to programatically create new events or modify existing ones. Although 100% functional, we do not recommend you use this API unless you create your own Event Management system. To handle event registrations on your website, view the Event Registration API details below. This API incorporates lots of different functionality. Design your own custom event registration pages and accept payment for events. You can host event registration on your site, Webinato will authenticate your contacts, and insert them back to your CRM or email/marketing automation tools. The API also tracks registrants through your platform and handles payment processing. Create and modify your company’s users through your database and have it reflect in the Webinato platform. Sync it with your intranet to add, modify, and delete users and update their permissions. This API is also available using XML-RPC (Deprecated – Not recommended to use). This is helpful when trying to modify your Webinato room settings across an entire enterprise programmatically. Use your company’s intranet to fully customize your room configuration or add new rooms. No longer will internal users have to login to a separate platform to update their settings. This API was built for Webinato resellers to view and modify properties for their client companies.